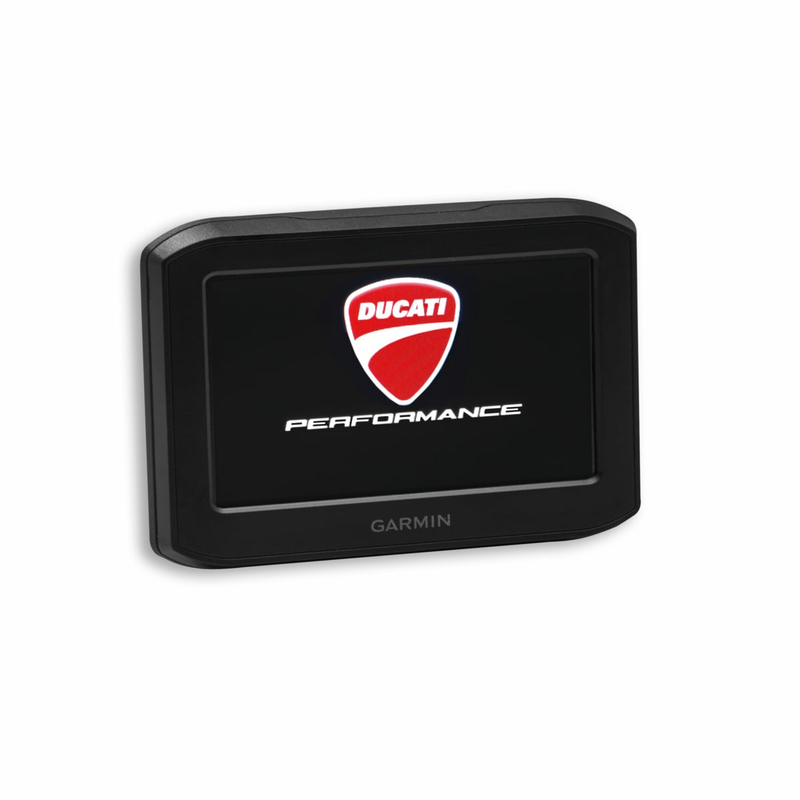 Ducati Zumo 396 satellite navigator kit. Equipped with prearrangement for ergonomic installation on the motorbike through top support, which makes it clearly visible also even with a tank bags installed thanks to a wide 4.3 display . It fully satisfies the needs of the most demanding riders. The glove-friendly user interface makes it simple to use. Its body is sturdy, waterproof, and resistant to fuel splashes and UV. It is equipped with a Bluetooth® module allowing the rider to make a hands free call (when connected to the smartphone, via compatible earphones and helmet) and listen to music from the internal MP3 player. It saves the paths travelled, which can be exported to a PC for storage purposes and for exchanging them with other users in wireless mode. It also includes the Group Track Function to share routes in real time (via Smartphone Link). The functions “Round Trip”, “TrackBack®” and “Percorsi avventurosi” top off this equipment, to travel on routes full of bends; and finally the Rider Alerts function that promptly warns the rider of speed limit changes and the presence of speed camera stations or camera-controlled traffic lights. It includes a preloaded map covering 46 countries in Europe, lifelong updates free of charge and built-in Wi-Fi® to download the maps without cables. Includes the Navigator high support set part.